These are our partners supporting use. Thank you guys ! Get your own awesome map with StepMap! StepMap – Put Everything In The Map! Let me introduce you to something new and something amazing – how do you feel about documenting the trips that you made and creating a map for everyone to see? StepMap will help you do just that. Share it with your friends through your blog or other social media sites. Tell everyone your stories using maps through StepMap. 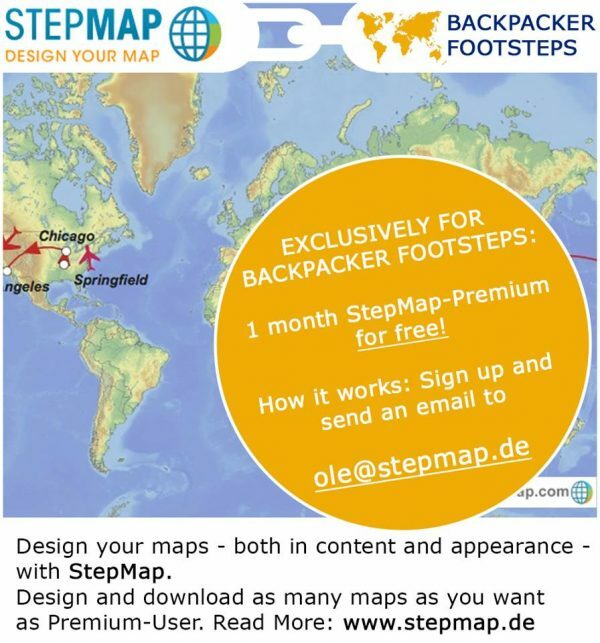 Send a email to ole@stepmap.de and write him that you are from Backpacker-Footsteps and start to make your own maps now!